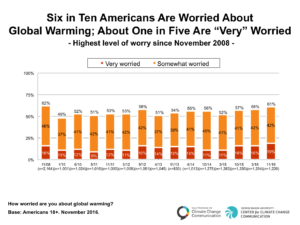 January 18, 2017 – (New Haven, CT) A nationally representative survey conducted shortly after the presidential election finds that the number of Americans “very worried” about global warming has reached a record high (19%) since first measured in 2008. A majority of Americans (61%) say they are “very” or “somewhat” worried about the issue – nearly equal to the highest level recorded in 2008 (62%). Likewise, Americans increasingly view global warming as a threat. Since Spring 2015, more Americans think it will harm people in developing countries (65%, +12 points), people in the U.S. (59%, +10 points), future generations (71%, +8 points), their own family (46%, +5 points), and themselves personally (41%, +5 points). Seven in ten Americans (70%) think global warming is happening, which nearly matches the highest level (71%) recorded in 2008. 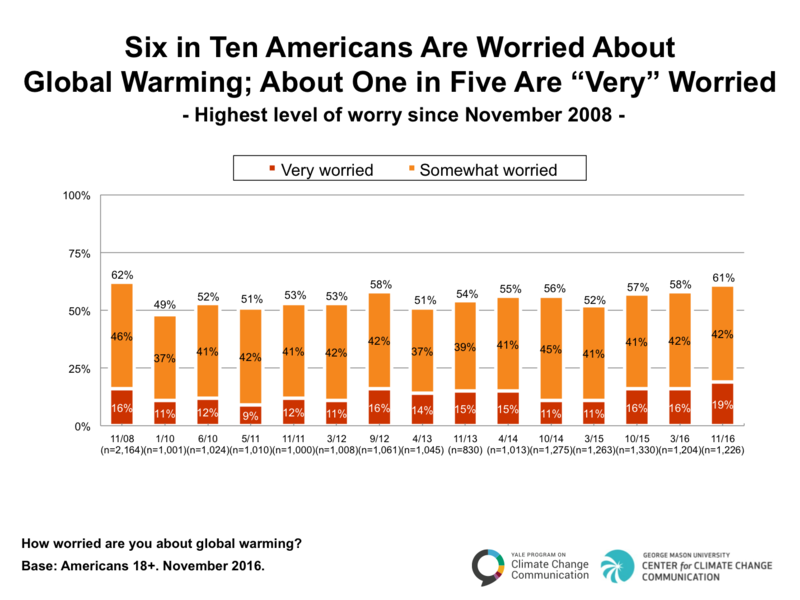 By contrast, only about one in eight Americans (13%) think global warming is not Americans are also more certain it is happening – the proportion who are “extremely” or “very” sure global warming is happening (45%) is at its highest level since 2008. Over half of Americans (55%) understand that global warming is mostly human caused, which is the highest level since 2008. By contrast, three in ten (30%) say it is due mostly to natural changes in the environment – the lowest level recorded since 2008. Six in ten Americans (61%) say the issue of global warming is either “extremely” (10%), “very” (17%), or “somewhat” (34%) important to them personally. Four in ten (39%) say it is either “not too” (22%) or “not at all” (16%) important personally. By a three-to-one margin, Americans say that schools should teach children about the causes, consequences, and potential solutions to global warming (76% agree vs. 24% who disagree). These findings come from a nationally representative survey (Climate Change in the American Mind) conducted by the Yale Program on Climate Change Communication and the George Mason University Center for Climate Change Communication. The survey of 1,226 American adults, aged 18 and older, was conducted November 18 – December 1, 2016 on the GfK KnowledgePanel. In addition to Drs. Anthony Leiserowitz and Edward Maibach, principal investigators included Dr. Connie Roser-Renouf of George Mason University, and Drs. Seth Rosenthal and Matthew Cutler of Yale University.